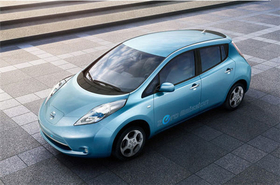 Nissan´s battery-powered Leaf, pictured, will cost about $37,000 in Europe after incentives. TOKYO (Bloomberg) -- Nissan Motor Co., aiming to be the biggest seller of electric cars, said a lower U.S. price for its Leaf hatchback compared with Japan and Europe reflects differences in local taxes and incentives and that the vehicle will eventually make money in all markets. Nissan said this week its battery-powered Leaf will cost about $37,000 in Europe after incentives. That compares with $32,780 in the U.S. before incentives and a base price in Japan of more than $40,000. Variations in import fees, taxes and incentives account for the disparities, said Tom Smith, Nissan's chief marketing manager for European electric auto sales. “If you just translate the U.S. price into euros, you seem to get a significant difference,” Smith said in a phone interview from Nissan's headquarters in Yokohama, Japan. Excluding Europe's higher tax on the vehicle and an import duty that's four times that in the U.S., “we are priced at exactly the same level in both markets,” he said. The Leaf, powered by a lithium-ion battery pack, will go on sale in Japan and the U.S. this year and in Europe next year. Nissan's CEOCarlos Ghosn has set a goal of leading sales of rechargeable vehicles, which he estimates may make up 10 percent of global auto demand by 2020. While competitors Toyota Motor Corp., General Motors Co. and Ford Motor Co. are preparing to sell battery-powered and plug-in hybrid models, none has announced plans matching Nissan's goal of being able to sell as many as 500,000 electric cars by 2012. Nissan aims for the Leaf to compete in price with Toyota's gasoline-electric Prius and Honda Motor Co.'s Civic Hybrid in the U.S. The vehicle qualifies for a $7,500 federal tax credit and may get an added $5,000 rebate in California, where large automakers are required to sell electric vehicles. Based on cost estimates for Leaf's battery pack, electronic components and production, the U.S. price seems too low, at least initially, said John Kluza, a battery analyst at Lux Research in Boston. The current cost of the 24-kilowatt-hour battery pack, capable of propelling the Leaf as far as 100 miles (160 kilometers), may be about $20,000, Kluza said. Nissan has declined to provide cost details. The U.S. price excludes local sales taxes, which vary across the country, and a destination and handling charge of about $800, according to Jung. Takeshi Miyao, a Tokyo-based analyst for consulting company Carnorama, estimates battery-pack and component costs for the Leaf are about 2.45 million yen ($26,900), excluding labor and other expenses. Nissan is factoring into the price the longer-term impact of state and U.S. federal incentives it won to produce the Leaf at its Smyrna, Tennessee, plant and build a lithium-ion battery factory next to it, said KG Duleep, who researches advanced auto technologies for consultant ICF International. Those incentives included a $1.6 billion low-cost federal loan won in 2009. It took Toyota at least 10 years to make a profit on its Prius, which was introduced in 1997, when research, development and capital costs are included, said Koji Endo, managing director at Advanced Research Japan in Tokyo. It may take Nissan about the same amount of time, he estimated. For a new car powered by a conventional gasoline engine, it usually takes about four years to make a profit, he said. Nissan has a goal of 20,000 advance orders for the Leaf, which is set to begin arriving in the U.S. late this year. The company will mark the start of construction of its U.S. battery plant in Smyrna on May 26. The facility, to open in 2012, will have capacity to make lithium-ion battery packs for as many as 200,000 vehicles annually.